Hello everyone. This year we have a lot of exciting things happening. Expanding our services and doing more with illustration and surface pattern design is at the top of that list. To kick things off, get some inspiration, and get the creative juices flowing, this year I participated in the Make it in Design Summer School 2015. This was a wonderful experience. Not only did it give me the opportunity to connect with designers from all over the world, but it was full of so much useful information, tips, tricks, and above all motivation and inspiration to continue down this path. 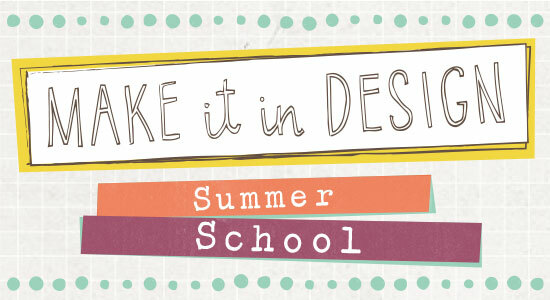 Head over to the Make it In Design site to check out more information on Summer School and to see the galleries of everyone’s work here! As part of the summer school process we received two creative briefs to design patterns for and 2 fun challenges. The first creative brief we had was Soft Pop, Bright Retro. I am a super fan of anything retro and love color. From that start this one sounded like a lot of fun. 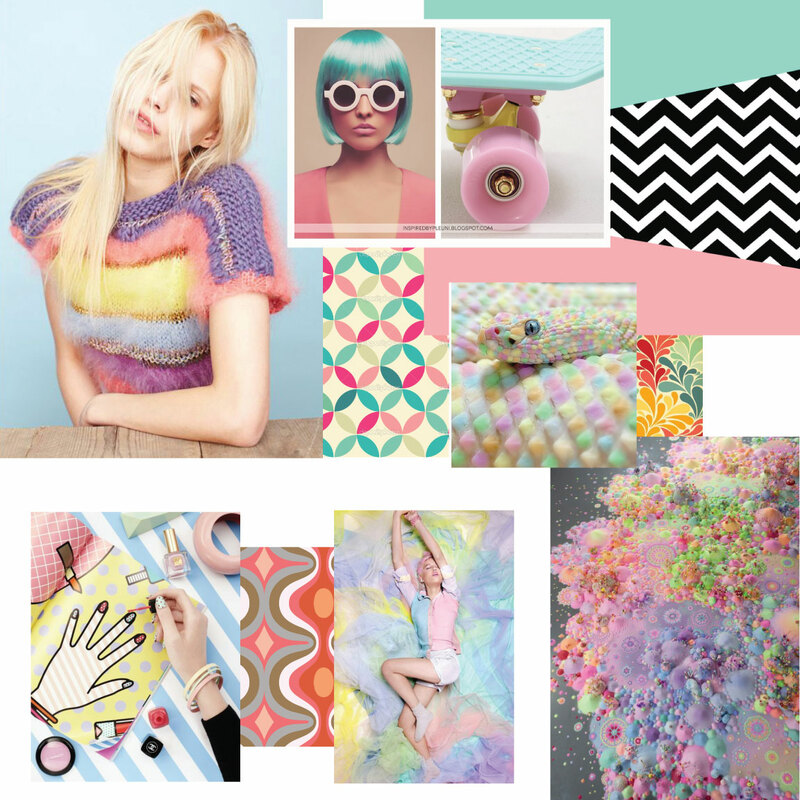 I created a mood board for this project. I then really grabbed on to the one image with the outlined hand from my mood board. It just screamed 1980’s to me, which was interesting considering I usually avoid anything and everything 80’s patterned. Not this time. I went with it and could not get away from the idea of an 80’s style pattern. This creative brief got me a little obsessed with 80’s and took me outside of my comfort zone of what I would usually design. I ended up with the pattern I am calling “Totally Rad”. 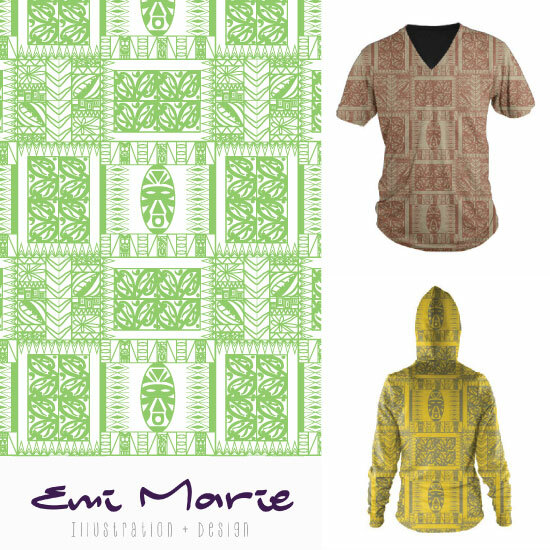 Here you can see it below; along with a couple mockups I did of the pattern on some apparel and a pair of shoes. I have already had requests for each of these items to actually exist. The next brief was Eco Active Global Geometric. After researching all the information given to us and doing a little more internet research of my own I really wanted to go tribal with this. I easily could have gone more African tribal with it, but really didn’t want to as I see a lot of that right now and I wanted to take my pattern in a different direction. I started researching Polynesian Design and traditional Polynesian tattoos. After lots and lots of sketching I got my sketches into illustrator and recreated the motifs I thought I might want to use in my design. The final product had a definite Polynesian/Tiki influence to it and I am very pleased with where the design ended up. Below you can see the final pattern along with a couple mockups of it as well. Am I glad I signed up for this year’s Summer School? Yes! Would I recommend it for anyone else out there who enjoys surface pattern design? Yes! It was a great experience that I would gladly repeat. It helped motivate and inspire and there are a lot more projects in the works at the moment. I am also working on other patterns to go with each of the motifs created for summer school. I will be launching a collection based off each of them later this year. This will all come with the official launch of the Emi Marie Illustration + Design brand, which is the surface pattern design and illustration side of Studio Em Interiors. 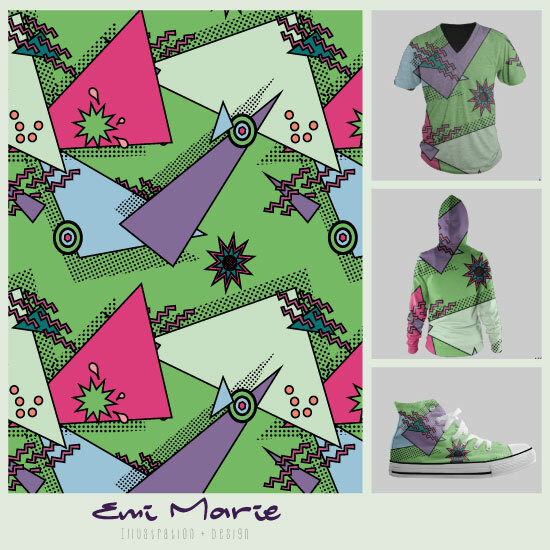 If you would like to know when the official launch is and when products with either of these patterns will be offered then hop over to the Emi Marie Illustration + Design website. There you can find all our social media links to stay up to date with what is going on and also sign up for the newsletter to be the first to know when the website officially launches, when products launch, and when new designs are available. So head on over to www.emimarie.com now!